"Bermuda skipped a generation, so we need to reintroduce it to a whole new group of people," says Allan Federer, general manager of the newly renovated and renamed Hamilton Princess & Beach Club (formerly the Fairmont Hamilton Princess). 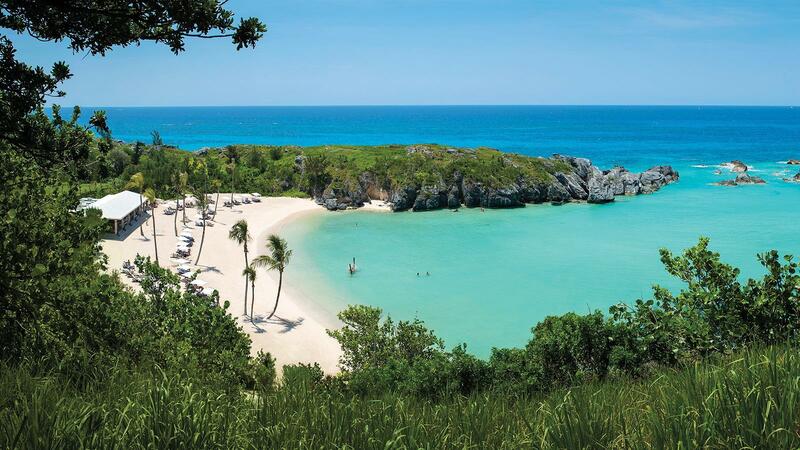 Following its "Mad Men"-era heyday, which peaked in the 1980s, Bermuda's allure lagged despite its pristine pink-sand beaches, scenic golf courses and British charm and sophistication. But the island, which is only a short flight from East Coast hubs, is looking to reclaim its place on top destination lists, and the updated "Pink Princess" is poised to cater to the next generation of travelers with contemporary design and hotspot culinary venues. The island's Green family who purchased it in 2012, have invested $100 million in upgrading the historic grande dame on the harbor in the capital city. Originally built in 1885, the property, with 400 rooms (from $399) including 45 suites and 13 junior suites, has been launched into the 21st century with fresh, modern interiors. Museum-worthy contemporary artworks by Andy Warhol, Damien Hirst, Banksy, Takashi Murakami and Philippe Decrauzat hang throughout the public spaces and restaurants. The new full-service marina is a social hub for guests as well as locals, who gather for cocktails at the al fresco 1609 Bar & Restaurant. The marina is also a popular spot for Marina Nights with music, tapas, cigars and whiskey flights. "Cigars are big in Bermuda," says Federer, who notes that the Greens are cigar lovers. "Our guests like that they can come here and get Cubans and other great cigars." Celebrity chef Marcus Samuelsson was tapped for the hotel's premier dining venue, Marcus', which is modeled on his popular Harlem restaurant Red Rooster. Capitalizing on a network of local producers—including organic farmers and fishermen who deliver fresh—caught wahoo, bonito, snapper, amberjack and octopus right to the marina dock-the culinary concept fuses Caribbean, Portuguese and Asian influences. Highlights include fish chowder croquettes with black rum aioli; shrimp and pork belly hot rice with jerk glazed pork belly, shrimp fried rice, kimchi and grilled pineapple; duo of crudo with local fish tartar, radish, jalapeño, crispy rice, apple wasabi, and beet cured salmon; and Aleppo-honey-glazed salmon with shiitake mushrooms, kale and roasted turnips. Samuelsson also designed the menu at the hotel's private beach club on Sinky Bay, a cove on the island's south shore. The Princess Beach Club helps broaden the hotel's business image by catering to guests who want to lounge on pink sands, swim and snorkel in crystalline turquoise waters. Those waters and the natural reef that surrounds the island are a major draw for divers, who can explore hundreds of shipwrecks. Meanwhile, golfers can choose from seven courses on the island, which boasts the highest concentration of golf courses per square mile in the world. The Hamilton Princess' rejuvenation is perfectly timed for a Bermudian renaissance, which is expected to get a considerable boost as the island hosts the 35th Louis Vuitton America's Cup this summer.